Both Dragon and VoiceComputer cannot be installed without the user having Administrative Rights. While most users have their Windows users set up as Administrator, corporate clients may have no or restricted administrative rights. Corporate users should have access to their IT personnel and contact us at info@voicecomputer.com before attempting to install Dragon and VoiceComputer. Otherwise neither will install and Dragon will not work properly if not installed correctly. Both Dragon and VoiceComputer must be installed on your boot drive (i.e., C drive). Dragon absolutely cannot be installed on any other drive but drive C. Installing VoiceComputer on a secondary drive will cause it to function improperly. As regards Dragon, only your user profiles can be created and/or installed on any drive other than drive C. Please contact us before in attempting to install either Dragon or VoiceComputer so that we can talk to your IT with regard to proper installation of both. Dragon and VoiceComputer are linked to one another such that If VoiceComputer is loaded, both must be shut down via the VoiceComputer Control Center. Say 'open VoiceComputer' or double-click on the VoiceComputer shortcut (icon) on the desktop and select (say) 'Shutdown Speech' to close both Dragon and VoiceComputer. Do not just close VoiceComputer. Once VoiceComputer is closed, your Dragon user is saved properly and Dragon is unloaded, double-click on the Dragon NaturallySpeaking shortcut (icon) on the desktop and open your user profile. Test again. Press and hold down the control key (Ctrl key) if you can. Test all commands that are not working while holding down the control key. If the problem persists go to Step 3. If you are unable to perform this manual test of a command recognition (i.e., you need to work completely hands-free), please get help or assistance in order to do so. Beginning with Dragon 13 through Dragon 15, the Audio Setup Wizard has been simplified and no longer contains the Volume Check or Quality Check screens. It also no longer contains a playback off. If you need assistance with running the audio setup wizard in Dragon 12 and below, contact us at info@voiceteach.com or post a request for help on the VoiceComputer forum. Note that the VoiceComputer help no longer contains help or support for any versions of Dragon below Dragon 13. When reading the text in the Audio Setup Wizard (Check Microphone) be sure that you read the text at a smooth natural pace keeping the volume of your voice at a normal conversational level. Also make sure that your microphone is positioned correctly at the corner of your mouth or correctly in front of you if you're using a desktop microphone, such as the SpeechWare 6-in-1 or the SpeechMatic USB MultiAdapter & USB TravelMike. In other words, read the text as if you were a newscaster reading the news off a Teleprompter. To run the Audio Setup Wizard you can say "check audio". 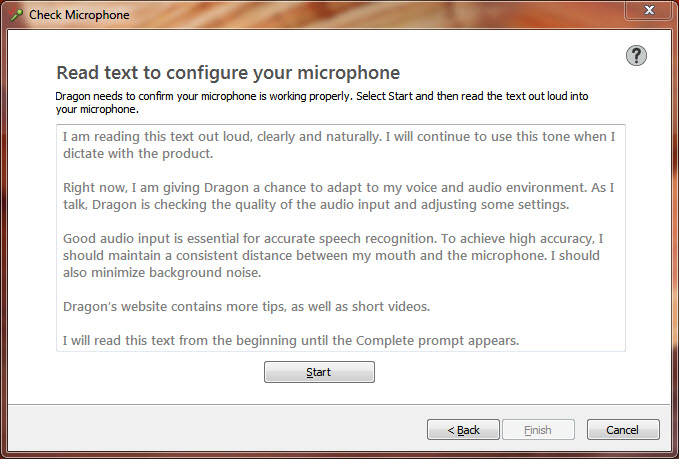 This voice command works for all versions of Dragon up to and including Dragon 15. 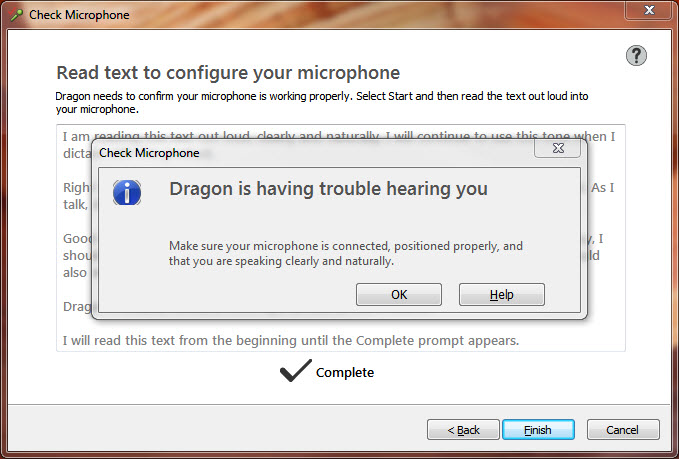 Otherwise, you can right-click manually or by voice on the Dragon microphone icon in the system tray, select Audio and then select "Check microphone" The same applies to running the Audio Setup Wizard from the DragonBar. Carefully read the instructions in each screen and then click on "Next" to proceed. Click on the Start button and read the text at a natural pace, using a normal tone of voice and volume until you get the next screen. Click "Finish" to complete the Audio setup (i.e., microphone training). Note that the Audio Setup Wizard is what Dragon uses as minimal training vs. General training to adjust your Acoustic Model (i.e., speech patterns). In other words, it's a short training used in order to get your user profile up and running. On occasion, the audio setup can fail for a number of reasons. Step 1: As the message suggests, check the microphone connection to your soundcard. Disconnect and reconnect your microphone. Then try running the Audio Setup Wizard (Check Microphone) again. If this doesn't solve the problem, go to Step 2. Step 2: Open the windows Sound dialog as shown below. 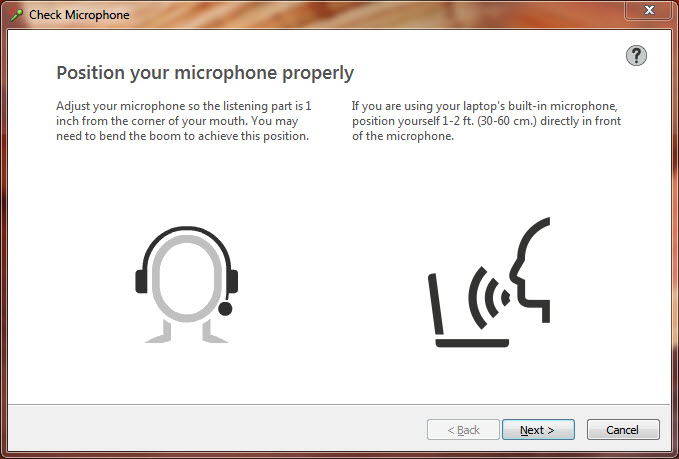 Note that Windows does not recognize microphones per se. It can only recognize your soundcard or USB SoundPod. The reason for this is that only your soundcard or USB SoundPod can send information to Windows via the DSP (Digital Signal Processor), which has hardcoded information that can be read by Windows. 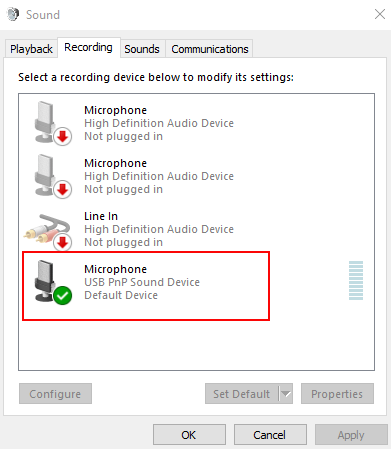 Make sure that the default microphone it is correct for your microphone/soundcard or USB SoundPod. If there are other Recording devices that are listed and/or active, disabled them but don't hide them. You should only be using one Recording device at a time. Otherwise, Windows can switch Recording devices on you without your knowing it. With the Windows Sound dialog open as shown above and the correct default Recording device selected, try your microphone again. You should see the volume meter at the right fluctuating, thus indicating that the Recording device (Default Device) is picking up your voice. If the default Recording device is not picking up your voice when you speak, try jiggling the wires (wired close talk microphones) and see if that makes a difference. If you using a USB SoundPod that has a "mute" button, make sure that the soundcard is not muted. For example, the SpeechWare desktop microphones (SpeechWare 3-in-1, 6-in-1, 9-in-1) or the SpeechMatic USB MultiAdapter & USB TravelMike all have mute buttons. Make sure that they are indicating either green or blue depending upon the mode that you're using. If the mute button is red, then the soundcard is muted. Test again. If the problem(s) persist(s), and if possible, try another microphone. If trying a new microphone or a different microphone fails with the same warning message, you may have to replace your microphone and/or USB SoundPod. USB SoundPods seldom fail, but they can. 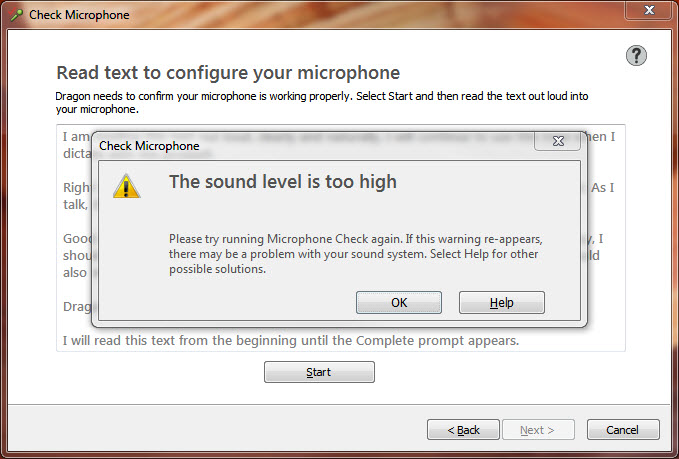 In most cases where the above warning message is produced in the Audio Setup Wizard (Check Microphone), the problem is generally not with the soundcard, but more likely a problem with the microphone itself. Some microphones, such as the Sennheiser ME3 and/or the Audio-Technica Pro 8HEmW, use a mono output Jack, which does not seat well on some soundcards. These types of microphones may require a mono to stereo adapter in order to seat properly. Under such conditions the microphone may be perfectly OK, but because of the problem with proper seating in the soundcard, may result in no output signal, a low output signal, or distorted output. ◊ The microphone that you're using may be producing too strong an input signal. Try moving the microphone element further away from the corner of your mouth and make sure that the microphone element is at or slightly behind the corner of your mouth and not in front of your mouth or resting against your mouth. Adjust the position of the microphone element and retest until you get the Audio Setup Wizard (Check Microphone) to complete successfully. ◊ You may be talking too loud. Try speaking in a more normal (lower) tone and volume. You may have to adjust the volume and tone of your voice in order to successfully the Audio Setup Wizard (Check Microphone). ◊ One example of such a microphone is the SpeechWare FlexyMike DEC, which tends to produce a very hot input signal (i.e., high-volume). With such microphones a combination of positioning the microphone element approximately 1 inch or further away from the corner of your mouth and speaking in a lower, more normal tone of voice and volume will likely provide a successful result. If you're not sure exactly how to create a new user profile, make sure that both Dragon and VoiceComputer are loaded and say 'Show Create User File'. If you're using Dragon 12 or below, click on the "DNS 12 User Profile". Follow the comprehensive instructions and video. ◊ We do not recommend selecting the "Medium" vocabulary. While the "Medium" vocabulary will reduce the amount of RAM by approximately one half vs. the "Large" vocabulary it can reduce your overall accuracy. The reason for this is that it does not reduce the number of words in the Active Vocabulary, but it does reduce the size of the Language Model. By decreasing the size of the Language Model, only the most common "contexts" are implemented. Unless you are working with pre-Sandy Bridge CPUs and are restricted to less than 8 GB of RAM, using the "Medium" vocabulary is not recommend. ◊ In Dragon 13, the BestMatch V Far Field Speech model is restricted to US English. However, the Far Field Speech model should really only be used if you are using what is technically defined as a Far Field microphone (i.e., SpeechMatic USB MultiAdapter & USB TravelMike, SpeechWare TableMikes, array microphones, or desktop microphones that allow you to dictate from a distance of between 12 and 24 inches from the microphone element). Selecting such if you're a close talk microphone (wired headset) will not generally and/or negatively impact the performance of such. ◊ Dragon 14 expands the Far Field algorithm availability (i.e., Speech model option) to multiple languages. 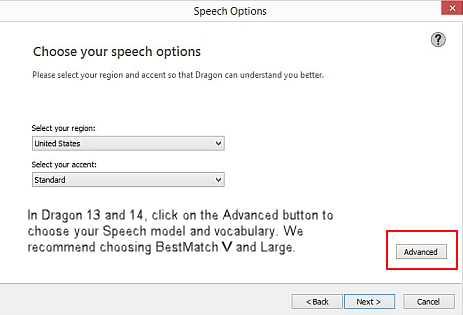 ◊ Dragon 15 does not have any "Advanced" Speech model or vocabulary selection options. Dragon 15 has only one option which is automatically implemented on profile creation. That is, BestMatch IV General-Large. The reason for this is that the modifications made to the speech engine in Dragon 15 only require a single core for processing dictation. Therefore, BestMatch V is no longer necessary. In Dragon 15 BestMatch IV General-Large reduces the amount of RAM necessary by approximately one half when using the Large vocabulary, while maximizing and speeding up access to the Language Model. This is true even with older processors with limited RAM. ◊ In Dragon 15, the Far Field algorithm is now hardcoded and integrated into the Speech model for all microphones and languages/accents. This improves overall accuracy and performance for all users. Important When creating a user profile in Dragon 15, be sure to modify the Dragon Options | Miscellaneous option | Speed vs. Accuracy slider to "Most Accurate" (100%). By default Nuance has set this to "Fastest Response" (0%) in a misguided attempt to accommodate older processors with limited RAM. In most cases, this setting is unnecessary and restrictive in that it tends to reduce overall accuracy vs. decreasing latency. In the majority of cases increasing the Speed vs. Accuracy not only improves overall accuracy, it doesn't generally affect performance (i.e., speed of speech to text display when dictating). 2. Once you have created a new user, you will be prompted to run the Audio Setup Wizard (Check Microphone) as described in Step 1 above. If you experience any problems, follow the instructions for correcting such until the Audio Setup Wizard (Check Microphone) completes successfully. 3. Test your new user profile for both accuracy and command execution. If it is working properly and you are not experiencing any of the problems you were having with your original user profile, then you can reopen your original user profile, export your custom vocabulary and/or custom commands and transfer these to your new user profile. If you need help with this, simply go to the VoiceComputer forum (say 'Show forum site' or click on the following link: VoiceComputer forum), register if you have not and post an entry asking for help on transferring your custom words and custom commands. Be sure that your clear on the version of Dragon that you're using (i.e., Professional, Preferred, Premium, 10.1, 11.5, 12, 13, 14, 15, etc.). There are different ways of transferring your custom words and custom commands depending upon the version and flavor of Dragon NaturallySpeaking that you're currently using. If your new user profile still exhibits the same problems that you have been experiencing, then go to Step 4. By default Dragon NaturallySpeaking installs a server that is used for creating a wireless microphone profile via either your iPhone (DNS 11.5) or iPhone and/or Android smartphones (DNS 12.0 only Re: Android smartphones). This server can occasionally cause Dragon NaturallySpeaking to crash, particularly if you're using Dragon NaturallySpeaking 11.5 or 12 In addition, if you are not using either your iPhone or you're Android Smartphone as a wireless microphone for use with Dragon NaturallySpeaking, or don't intend to, this Smartphone wireless server is not useful, occupies RAM when you load Dragon NaturallySpeaking, and can cause problems. Unfortunately, Nuance does not provide any means of disabling this server. However, there are basically two ways that you can disable the dnsspserver. 1. The simplest way to do this is to simply open the Windows task manager, locate the dnsspserver.exe entry under Processes, and close it (end task). Although this is the simplest way to close this server, it must be done every time you load Dragon NaturallySpeaking. Make sure that you have administrative access in order to be able to rename these files. Otherwise you will get an access denied error. Once you have renamed these files, close down and restart VoiceComputer and Dragon using the VoiceComputer Control Center and selecting 'Restart Speech'. The dnsspserver will now be permanently disabled each time you load Dragon NaturallySpeaking. Note that we do not recommend using this procedure for those users who are not experienced at performing such. If you don't clearly understand what you're doing, then we strongly advise you to use #1. If creating a new user profile doesn't solve your original problem(s), then Dragon may require a Repair of its program files. However, before you do this, we recommend that you open 'Managed User Profile', Click on the Advanced button and select Export all of your user profiles to the Windows desktop so they will be easy to find and import if you need to, and you will need to in Step 5. So, it's better to do it now so that you always will have access to them if you need them. To run a Repair of Dragon NaturallySpeaking, open the Windows Control Panel and click on Add or Remove Programs (Windows XP) or Programs and Features (Windows Vista/7/8/10). Locate the entry for Dragon, highlight it, and 'click Change'. This will, or should, bring up the Dragon InstallShield wizard with the options to Modify, Repair, or Remove. Click the radio button for Repair and continue as prompted. it's important to note that Dragon 14 and 15 no longer supports Windows XP. They will only install on Windows 7 through 10. NOTE: Dragon Professional Individual 14 & 15 if purchased as downloads or even the DVD directly from Nuance (i.e., Digital River), you will not get the full set of installation and setup files. What you will receive is the Nuance Download Manager. When you execute the DLM, Nuance will download an installation executable file (i.e., WM-K81A-48000.exe – Dragon 15). Under these conditions when you install Dragon 14/15, the installation is done on-the-fly from the Nuance FTP server depending upon your version of Dragon (i.e., 14 or 15). Unless you obtain a full set of the installation and setup files from a secondary source, there will be no option to "Repair" Dragon 14 or 15. The only option you will have is to re-execute installation executable file as noted above. Doing so functions as a substitute for the "Repair" option. Nevertheless, this option complete reinstallation of Dragon 14 or 15. Just make sure that you have closed all applications, including and especially Dragon and VoiceComputer before doing so. 1. Before you run a Repair of Dragon and after you have exported your user profiles, and remembering to export both the original and the new user profiles, be sure that you double-click on the VoiceComputer icon And Select 'Shutdown Speech'. Be sure that both Dragon and VoiceComputer are completely shut down. Also, close any other open applications, particularly those that link to Dragon (e.g., Internet Explorer, Microsoft Word, Microsoft Outlook, etc.). In fact, it is advised that you close down all applications before proceeding with the Repair. This is necessary to avoid complications that may require you to reboot your system and/or close any open applications before the Repair will continue. 2. When the Repair has completed, reload Dragon NaturallySpeaking and test both of your user profiles (the original and the new). If this procedure resolves the problem, then you can go back to using your original user profile, but we strongly advise you to keep your new one anyway. You may need it in the future. 3. If performing a Repaired doesn't fix the problem(s) that you have been having, then the problem may be more complex than simply running any of the steps above. Follow the procedures in Step 6 to perform a complete uninstall and reinstall of Dragon. Under the conditions that none of the above steps resolves the problem(s) that you're having, the last resort is that you need to do a complete uninstall and reinstall of Dragon. First, we do not support Dragon 13 Home. Therefore, the following procedures apply to Dragon 13 Premium/Professional, Dragon Professional Individual 14 and Dragon Professional Individual 15 only. Second, make sure that you have exported all of your user profiles to the Windows desktop. The procedures that we are going to use in this step will cause you to lose your user profiles if you don't export them (all of them). Where ##= your version of Dragon. Make sure that you copy that serial number to a safe location before you uninstall Dragon. This is critically important, so don't forget to do this first. Next, while you are connected to the Internet, and you must be connected to the Internet in order to recover any Dragon Activations associated with your original installation of Dragon, follow the same procedures as in Step 5, except that in this case you would click on the Uninstall option at the top of the Programs and Features screen (Windows 7/8/10) . If you are prompted with the Dragon UninstallShield wizard displaying Modify, Repair, or Remove, be sure that you select (click on Remove). Otherwise, Windows will generally prompt you asking if you want to continue and remove Dragon. Do so. In other words, select the appropriate prompt when uninstalling from the Windows Control Panel. You will be asked if you want to save your user files. You should answer the prompt with 'No' because the next procedure in this step will delete them anyway. This is why you must make sure that you export your user profile to the Windows desktop and make a copy of your Dragon serial number. before you perform this step. Once the uninstall is complete, you may or may not be prompted to reboot your computer. If a reboot is recommended, do so. The next step in this procedure is to run the Dragon remove utility. This cleans out of the Windows system registry and all the appropriate files and folders for everything associated with Dragon. In other words, the Dragon remove utility cleans everything related to Dragon off your system, including your user profiles. This procedure allows you to reinstall Dragon clean with no left over registry entries, user profile(s), files, or folders of the previous install remaining so as to prevent conflicts or corrupt your install (reinstall). It does not touch the profile(s) that you exported. It only deletes the user profiles that are in the user profile folder for Dragon. You can obtain the Dragon remove utility from the link below. This Dragon remove utility is the most current and is backward-compatible with all versions of Dragon. This is the only version of this utility that you need regardless of the version of Dragon that you're using currently. Once you have downloaded and saved the above Dragon remove utility to your Windows desktop, locate it and double-click on it. All you need do is follow the prompts until it completes. Once the remove utility has completely cleaned Dragon off of your computer, perform a cold boot. That is, power off your system and then power it back on. We recommend against performing a warm boot (Restart) because a Restart does not always completely clear the RAM, which on occasion can come back to haunt you. The next step is to Reinstall Dragon NaturallySpeaking. Reinstall your version of Dragon using the original source file or media (DVD). Follow the instructions as prompted. If you have a problem with the installation, contact us at info@voiceteach.com for assistance, or post a detailed explanation of the problem you're having on the VoiceComputer forum. Be sure that you enter the serial number correctly. Nuance does not use the letter 'O' in any of its serial numbers. Nuance only uses the digit '0'. If you transpose or otherwise enter the serial number incorrectly, Dragon may allow you to proceed with the installation, but the activation process below will indicate that your serial number is invalid and require that you reenter it correctly. Once the reinstallation of Dragon NaturallySpeaking is complete, double-click on the Dragon (shortcut) icon on your desktop. You will be prompted to Activate Dragon. Follow the prompts for activating Dragon. Make sure that you are actively connected to the Internet when you do this so that the activation process can access the Nuance activation server and Activate your copy of Dragon. If you have any problems with activation, let us know, but please be clear and indicate all problems verbatim. There are times when the Nuance activation server may be down. If this is the case, you may have to wait until Nuance resets the activation server. Be patient under these circumstances because the error message that you get does not indicate that the server is down, only that it is inaccessible.. Again, if you have a problem please be clear and complete when you explain such. Once Dragon NaturallySpeaking is installed and activated, you will be prompted to create a new user. This is not necessary as long as you have correctly exported your previous original and new user profiles. All you have to do is to exit from the create new user dialog, go to the DragonBar and click on the Profile menu, select 'Managed User Profiles', Click on the Advanced button, and then click on Import. Locate each of your user profiles on your desktop and Import them. Note that you can only import one exported user profile at a time. So, the first profile that you import should be the one that you intend to use initially. Once you have done this, you should be able to open the 'Open User Profile' and select your imported user profiles. Open and test each user profile, beginning with the original profile that was giving you problems. If this profile loads and works properly in terms of accuracy and comand execution, you can continue to use it, but keep any additional or new user profiles for future use because you may such at some point in the future. If the problems that you were having persist, then there is a good likelihood that the problems go much deeper than Dragon. That is, they may be Windows issues. You should contact us immediately on the VoiceComputer forum and let us know. Again, keep in mind that if you are posting a problem on the VoiceComputer forum, you need to be clear, specific, verbatim, and provide us a detailed step-by-step description. We will do everything we can to help you. 1. 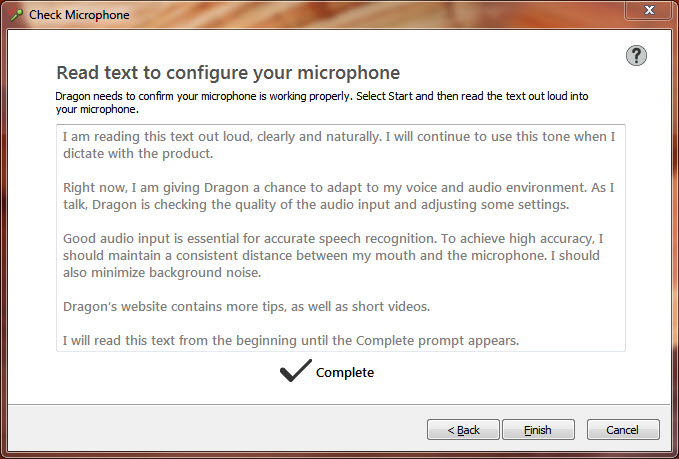 Dragon NaturallySpeaking requires administrative rights in order to install. You will need t work with your IT department if they do not grant you administrative rights in order to get Dragon reinstalled. 2. Under the above condition, once Dragon is correctly installed do not create any new users until your IT department has returned your status to the normal login for your Windows user (i.e., your administrative rights have been removed after installing Dragon). Creating a new user profile under administrative rights will not work and will give you an error when your administrative rights are removed. Once you re-logon with your Windows user, follow the appropriate procedures above for importing your original and new user profiles.